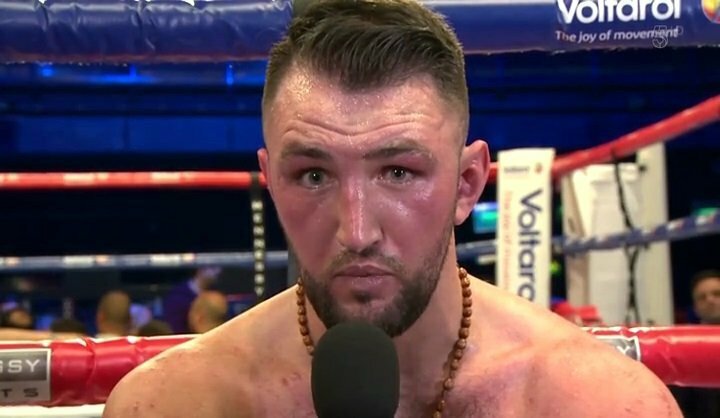 What next for Hughie Fury? Once-beaten (via debatable decision to Joseph Parker) world heavyweight contender Hughie Fury said before Saturday night’s crushing stoppage victory over defending British heavyweight champ Sam Sexton how he would be a harder puncher, a more spiteful puncher from here on in – and he delivered. In becoming the second-fastest man to stop Sexton, Fury arguably scored the most impressive KO of his career thus far. Fury against either of the three names Peter mentioned would be very, very interesting. The plan is to get Fury, 21-1(11) into mandatory position for one of the world titles, “so they can’t duck me,” Hughie said. A win over Charr is certainly a realistic possibility – if Team-Fury can get the fight made. Charr, the holder of a version of the WBA heavyweight belt, has that fight (that refuses to go away) with Fres Oquendo to deal with. As for Pulev and Povetkin, both are highly ranked (Povetkin by the WBA, Pulev by the IBF) and are perhaps close to getting a world title shot themselves, so they will be tough fights to nail down for Fury. Peter says he wants to get “whatever good fights we can get for Hughie,” and this may prove to be the biggest obstacle: getting the big and meaningful fights. Fury has a ways to go yet, but he is that tough sell in boxing: a fighter who offers a whole lot of risk and considerably less reward to any would-be opponent. Let’s hope he gets the big fights he both wants and deserves. Previous boxing news: Vasyl Lomachenko: The undisputed pound-for-pound king? You are here: Home / Boxing News / What next for Hughie Fury?